I wrote an article recently for the Bromsgrove Standard available here, but I wanted to write another piece to tell you what is happening and to ask you to let the Boundary Commission have your views. Don’t delay, though. All comments have to be received by the Boundary Commission by February 8. What are the Boundary Commission proposing? At the moment there are 120 Councillors representing 40 wards in Birmingham. The wards are all large – on average 18,000 people. Each one has three Councillors elected to represent people there. Under the Boundary Commission proposals, the overall number of Councillors would be reduced from 120 to 101. The size of wards would also be dramatically reduced, with one or two Councillors representing each of them rather than three. You can see and comment on the Boundary Commission’s plans here: https://goo.gl/53V1vo. In the Birmingham Northfield Parliamentary constituency there are currently four wards. One is called “Northfield” (like the name of the Parliamentary Constituency of which it is part), one is called “Longbridge”, one is called “Weoley” and one is called “Kings Norton”. The name of each wards is meant to briefly describe the area it covers. 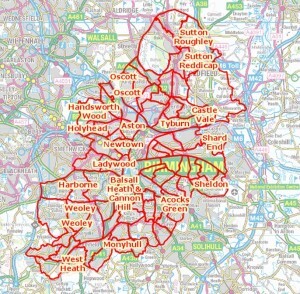 Being so large, however, Birmingham’s current wards each contain a number of different neighbourhoods and in many cases, people would not normally refer to the neighbourhood in which they live by the same name as the ward in which it sits. For example, parts of West Heath are in the current “Northfield” ward and parts of it are in the current “Kings Norton” ward. On a day to day basis, though, people living in the area would probably say they live in West Heath, whichever ward they are in. Other examples from the constituency are where people refer to themselves as living on the Allens Cross estate even though Allens Cross is in “Weoley” ward. Further south, local people might refer to themselves as living in Rubery-Rednal or Frankley even though both of these areas are in the current “Longbridge” ward. Where the boundaries are between wards are also sometimes odd. For example, half of Northfield High Street is currently in Weoley ward! What are the Boundary Commission suggesting for our area? Under the Boundary Commissions proposals, the existing large, three member wards in this area would be replaced by 8 smaller wards, each represented by a single Councillor and one slightly bigger one represented by two councillors. The single Councillor wards envisaged by the Commission are called Northfield West, Northfield East, Allens Cross, Frankley, Rednal and Rubery, West Heath, Kings Norton and Hawkesley. The bigger, two Councillor ward would be called Weoley. You can see which areas are covered by each of the new wards by clicking on the link above. There are different views on whether or not it is a good idea to move to single Councillor wards and even more so about cutting the number of Councillors to represent local people. Those who favour smaller wards say that it should helps Councillors develop a closer relationships with the people they represent. Supporters of three member wards say it can help Councillors to operate as teams. If changes do go ahead, however, the Boundary Commission appear committed to introducing smaller, single or two Councillor wards. The Commission has to try to ensure that all single Councillor wards should have roughly the same numbers of people living in them, just as two Councillor wards should be roughly the same size as each other. That being the case, wherever there are always likely to be roads here and there that might logically fit better on one side of a boundary rather than the other but have to stay where they are to make the population numbers add up. In submitting comments to the Boundary Commission, you can suggest redrawing boundaries between wards but please remember the need to keep the overall sizes of the new wards roughly the same. In an ideal world, there are changes I would like to make but overall the Boundary Commission’s proposals for this area seem sensible to me if a move to single or two Councillor wards are to go ahead. In the south of the constituency, we think it is wrong to lose the name “Longbridge” altogether as the Boundary commission are suggesting, particularly given its historical significance and the development of a new Longbridge Town centre. We therefore also propose changing the name of the Boundary Commission’s “Rednal and Rubery” ward to “Longbridge and Rubery Rednal”. Please let the Boundary Commission know your views too. What people say to them really can have an impact and your views are important. But hurry. The closing date is February 8th. If you think we are right about the name changes we are suggesting, please write to the Boundary Commission to tell them that. You do not have to comment on everything the Commission is proposing but Remember that it is as important to tell the commission where you think they have got their names or boundaries broadly right, as well as where you think they may have got something wrong.